Non-Domestic Product: No Screen Size: 4.7"
TERMS AND CONDITIONS 1. OUR CONTRACT AFTER YOU HAVE ORDERED Once you’re happy everything is correct and you’ve submitted an order you’ll be given a dispatch email when the invoice is printed at the dispatch stage, next you will receive a tracking number via your eBay purchase history. 2. PRICES AND PAYMENTS All our prices are in UK pounds (any euro prices are converted by Web interpret/ PayPal ex rate who translate all our listings). The total cost of your order will be the price of the products you order, the delivery charge (if any). If you wish to choose a special shipping request such as Saturday guaranteed at our discretion we can invoice you for this service. 3. DELIVERY AND COLLECTION All UK orders will be sent VIA royal mail on a 24 working hour service. All orders will be sent to the delivery address provided when you place your order (unless an address change confirmation is acknowledged via eBay messages). All our items International express shipping sales are delivered by courier (DHL Services) or by Royal Mail if economy is selected Once your order is confirmed, we will endeavor to deliver the goods within the delivery period that applies to the option you have chosen. 4. RETURNS / CANCELLATIONS Following the Distance Selling Regulations, we will accept items back even if you’ve open the good to inspect them. You are entitled to a refund as long as you return your goods within 45 working days from delivery. The goods must be in an “as sold” condition along with any accessories or free gifts received with it. Whilst the goods are in your possession you must take reasonable care of them. 5. FAULTY GOODS We aim to offer a 24 working hour return service, this means of you post your goods to us on Monday morning we aim to have an item on the way back you by Tuesday. Whilst this is usually possible it is an aim not a guarantee, sometimes we may need a little more time if for example the item isn’t currently in stock. We do not cover faults caused by accident, neglect, misuse, normal wear and tear by you or any third party, or any alteration or repair carried out without our prior approval. We can however invoice you separately for accidental repairs if pre-arranged. When you return goods to us: You must ensure that they are properly and securely packaged and labeled with our address. Include the return form or a cover note of your name and reason for return. You are responsible for any damage or loss in transit. We will require your item back first before a replacement or refund can be issued. Postage costs can be reimbursed (up to £25 for overseas returns). Postage receipts may be requested via ebay messages. 6. MISSING, DAMAGED OR INCORRECT ORDERS We do everything we can to ensure your order arrives at your door complete and as described. If you don’t receive your orders when expected, you can check that they have been dispatched using the tracking number we upload to your eBay purchase history or you can contact us on01752 696844. All of our items are subjectively graded meaning differences of opinion may occur, if this does happen we are happy to exchange or refund any item within the above legal time scales. A Grade Items- Excellent condition used mobile little or no scratches, moreover it is not guaranteed to be mark free due to being a used product. B Grade Items- Minimal Wear very good condition, these items will show marks and scratches which is why they are B Grade. C Grade Items - Will have some signs of wear to the unit, mainly markings on the back however there could be some on the screen in some cases. 7. 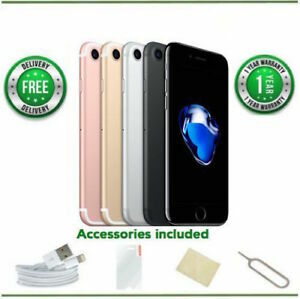 WARRANTY All Unlocked iPhones are supplied with our 12-month Warranty where faulty goods will be repaired or replaced with goods equal or greater in specification. Ant Network locked items we sell with warranty will run inline with the particular listing purchased from. All iPads will come with a 6-month or greater warranty again listing and model specific. As aforementioned goods will be repaired or replaced with goods equal or greater in specification. As above, we do not cover faults caused by accident, neglect, misuse, normal wear and tear, or any alteration or repair carried out without our prior approval. 8. VAT We operate under the VAT Margin scheme. The Margin Scheme - All items sold under the Margin Scheme will not have a VAT component on the invoice, therefore no VAT can be reclaimed. Whilst we make every effort to indicate which VAT scheme the product falls under in the Product Description, if you have strict requirements for a VAT qualifying product please contact us prior to placing your order to confirm. 9. PRIVACY We don’t share any of your information with 3rd parties. All power up items returned to us iCloud locked will be wiped if the necessary information is provided to us upon request. 10. GENERAL These Terms and Conditions, and all transactions relating to this website and all non-contractual obligations are governed by English Law and are subject to non-exclusive jurisdiction of the English Courts. We do not accept amendments to these terms and conditions. The iOutlet is a trading name of James Green Limited; Unit 30, Sisna Park, Sisna Park Road, Plymouth, PL6 7FH; registered in England No.8437263, Vat No. 140146358. DEFINITIONS IN THESE TERMS AND CONDITIONS We, us and our refer to James Green Limited. You and your refer to the purchaser or any goods from us. Goods means any goods, products, or services you order from us Order means an order placed by you with us for the purchase of goods. Es sind 107 Artikel verfügbar. Bitte geben Sie eine Nummer ein, die kleiner oder gleich 107 ist. Sofortige Zahlung von £179,99 erforderlich.